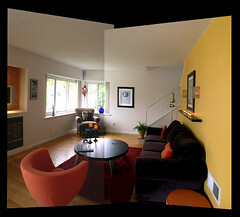 View of the main living space of the Deffaa Residence. Originally designed in 1937, this house is fortunate to have had owners willing to respect and care for the character of the house. Homes of this age require a commitment of resources and an eye for making an older home function to satisfy contemporary living standards.